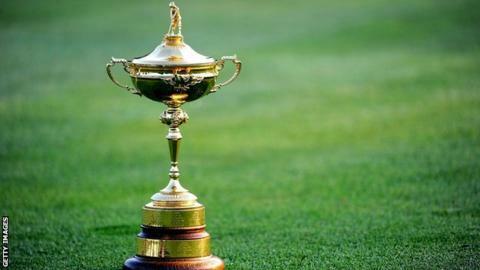 BBC Sport brings you full coverage of the 2012 Ryder Cup from Friday 28 to Sunday 30 September. There is exclusive live commentary of each of the three days' play at the Medinah Country Club, Illinois, on BBC Radio 5 live. Programmes building up to the event, a highlight of the 2012 golfing calendar, are to be broadcast up to two weeks prior to the first tee time. Hazel Irvine presents comprehensive highlights from the 2012 Ryder Cup on BBC television, with expert commentary from Peter Alliss and Ken Brown. The BBC Sport website will have live text commentary on all the action, simultaneous online streaming of highlights programmes, plus all the news throughout the tournament. Much of this service will also be available on mobile and tablet platforms. Four-time Ryder Cup winning legend Sir Nick Faldo, who played in a record 11 Ryder Cups and captained the side four years ago, is part of the BBC television's team of analysts. Rishi Persad will be the reporter out on the course. Television coverage begins with highlights of Day One's play at 00:00 BST on Friday 28 September, repeated Saturday at 11:00 BST. John Inverdale leads the BBC Radio 5 live team with golf correspondent Iain Carter and Andrew Cotter heading up the commentary. Insight and analysis comes from three-time European Ryder Cup captain Bernard Gallacher, 1999 Ryder Cup team member Andrew Coltart and multiple European Tour winner and current top 50 player Simon Dyson. Former Women's British Open Champion and Solheim Cup team member Karen Stupples and PGA Tour player Andrew Magee complete the line-up. 0000-0200 - BBC Two + BBC HD channel - Highlights from Day One. Streamed online on BBC Sport website. 1100-1300 - BBC Two + BBC HD channel - Repeat of Day One highlights. Streamed online on BBC Sport website. 0000-0200 - BBC Two + BBC HD channel - Highlights from Day Two. Streamed online on BBC Sport website. 1400-1600 - BBC Two + BBC HD channel - Repeat of Day Two highlights. Streamed online on BBC Sport website. 2300-0100 - BBC Two + BBC HD channel - Highlights from Day Three. Streamed online on BBC Sport website. 1900-2000 - BBC Two + BBC HD channel - Repeat of Day Three highlights. Streamed online on BBC Sport website. NB: All timings subject to change.